Due to a mix-up with screeners, I’ve spent the last 48 hours mainlining the second season of The Crown in an effort to complete my review prior to its December 8th premiere, and I have been successful. Having watched the full ten-episode season, I can happily report that the series remains just as successful on its second outing as it did on its first. And I can also report that you should absolutely not do what I did and binge the season. The Crown is many things, but it is absolutely a show that needs an audience to take its time with it, to savor it, to bathe in the ambiance and characters. This show is a five-course meal. It requires time. 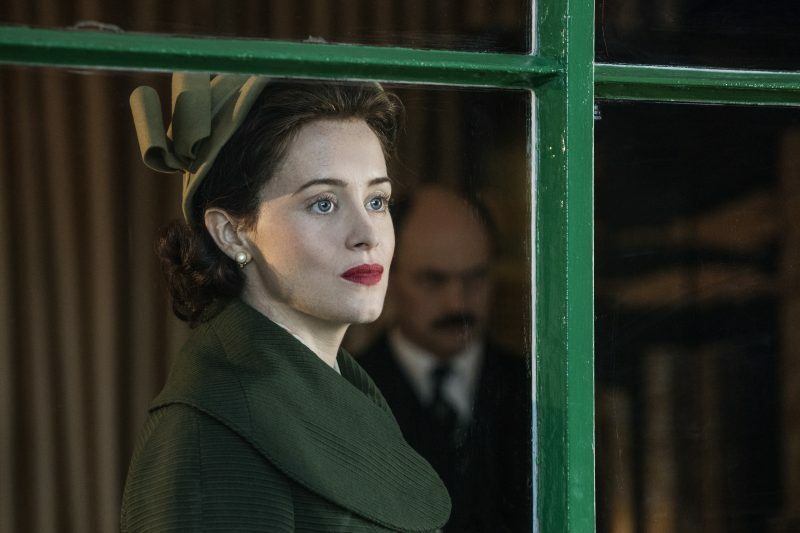 Watching habits aside, the second season of The Crown offers an even richer experience, on the whole, than the wonderful first season. We know these men and women, and we understand their relationship to the titular headdress. Leading the cast with poise and a brilliant performance once again is Claire Foy, taking her final bow as Queen Elizabeth II. Unlike in the first go-round, this Elizabeth has an inner strength we haven’t seen before. Yes, she still has the same internalized fear of failure (her father’s shadow continues to linger over her actions, despite being into her second decade on the throne), but Elizabeth isn’t afraid to confront problems head-on, whether they be the various potential scandals from Prince Philip (more on him later) or clashing with her Prime Ministers (joining the game this season, Anton Lesser- who you might recognize as Qyburn from Game of Thrones- in a strong turn as Harold McMillan). 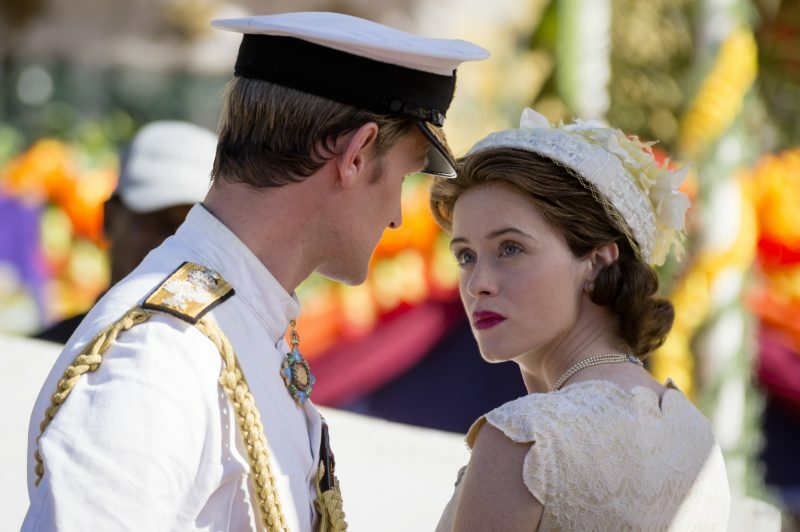 [caption id="attachment_101799" align="aligncenter" width="800"] The Crown - Elizabeth - Elizabeth watches Philip's plane take off[/caption] This stronger, more outwardly confident Elizabeth allows Foy to shade the character even more than last season. Whilst Elizabeth may have the poise to shut-down McMillan’s attempts to control her public persona, she continues to struggle with balancing her role as the Crown in her personal life. Things with Philip swing between détente and full-on Cold War. Little Prince Charles isn’t so little anymore, and decisions must be made regarding the future king’s educational pursuits. And then there’s Margaret. It is in the various scenes between Elizabeth and Margaret that Foy truly shines. After all, there’s nothing like the relationship between sisters. The structure of The Crown’s second season is slightly different from its first. It still covers the requisite ten years of Elizabeth’s reign, but the majority of the episodes are focused around a single character and his or her relationship to the monarchy. The structure works well throughout (with a few stumbles), but is most successful when the story turns to the aforementioned Princess Margaret, arguably the most complex and interesting character of the whole Windsor family. 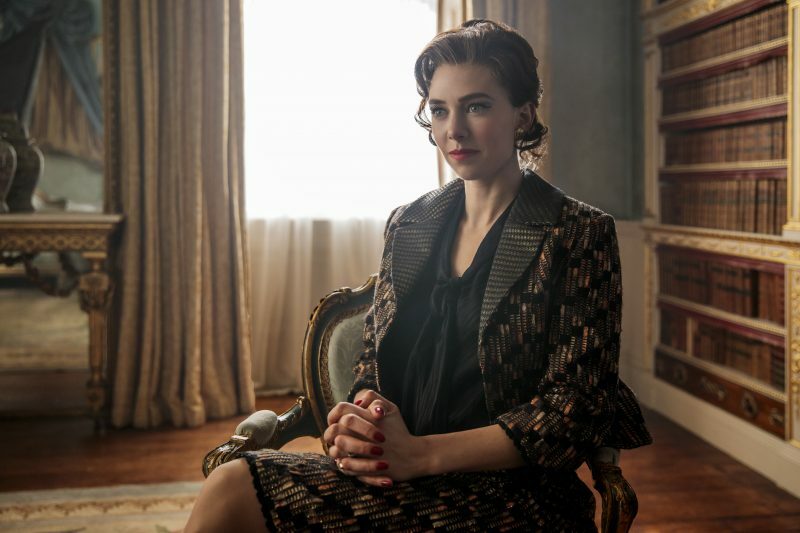 While much has been written about how the series plans on replacing its entire main cast for the next two seasons, I suspect the actor who will be most missed will be Vanessa Kirby, who has taken Margaret from a lovelorn young woman in season one to a whip-smart, yet vulnerable, force to be reckoned with in season two. [caption id="attachment_101798" align="aligncenter" width="800"] The Crown - Margaret - Margaret meets with Elizabeth to discuss her upcoming marriage[/caption] Taking a gander at Princess Margaret’s Wikipedia page highlights just how complex a person she was; and, perhaps more importantly, how tragic her story is when compared to her sister. The roots of that tragedy were planted in her failed engagement to Peter Townsend (which was a major plot point of season one), and season two takes a deep dive into how that loss impacted the rest of Margaret’s life- mostly for the worse. Take note of the excessive smoking, continued cool relationship with her sister, and the drinking (so much drinking), as each element is crucial to who Margaret is and will become. As for Vanessa Kirby, she takes what could easily turn into a caricature of a woman spurned and elevates it into a portrait of a woman who is trapped in a world she doesn’t want to leave. Unlike Elizabeth, Margaret adores the trappings that come with a royal title (she could have, ostensibly, married Townsend and lost her place in the royal line, but didn’t want to give up what she had). She is in a gilded cage of her own making. She loves the parties, the gowns, and the public persona. But she’s also a woman aware of exactly what she threw away to keep it- and Kirby is able to tread the thin line between making Margaret a sympathetic character and one who plots to get what she wants. It’s a complicated performance and every time Kirby graces the screen, a shockwave runs through the scene. She’s simply magnetic. Speaking creating sympathetic characters, the show’s one major misstep this season is its use of Prince Philip. No, there isn’t too much Philip (as many feared when watching the season trailer earlier this year), and he doesn’t supplant Elizabeth as the focus of the season. Rather, Peter Morgan and his writing staff have made the unfortunate decision to try and force a sympathetic reading on the character through a series of poorly placed flashbacks. The problem here is in the timing of these flashbacks, rather than in the story told within them. At this point in the series, I think it’s fair to say that the majority of the audience is Team Elizabeth when it comes to parsing the troubled marital relationship between the Queen and her husband. Throughout the first season, we were treated to Philip’s whinging and constant complaining about his place in the family and in the power structure of the monarchy. Things don’t get much better in season two. [caption id="attachment_101800" align="aligncenter" width="800"] The Crown - Philip, Elizabeth - Queen Elizabeth II and Prince Philip in Ghana[/caption] This isn’t to say that Philip isn’t an interesting character, or that Matt Smith doesn’t do a good job with the story he’s given. He is, and he does. However, we knew little of Philip’s background in season one. Season two tries to remedy that, showing us just how sad young Philip was, living in Nazi Germany. The inclusion of these flashbacks simply muddies the water of the story, dragging proceedings to a halt when we should be flying ahead. And, perhaps more egregiously, it’s blatantly clear that the only reason the flashbacks exist is to manipulate the audience into feeling sorry for Philip. It doesn’t work. At this stage, our opinion of Philip is fully formed. Had these flashbacks appeared back in season one, well, it might have been a different story. Here, however, it reeks of trying to get the audience to give Philip a pass for how he treats his marriage and how he treats poor Prince Charles*. *In a big surprise, the episode focused on 13-year-old Charles is excellent at exploring the young prince, and giving us a better understanding of how hard his youth was- as someone who never had particularly positive feelings towards him, I found myself shedding a tear and gaining a much deeper appreciation for what shaped him into the man he is now. So, is the second season of The Crown perfect? Absolutely not. But it is a smart, layered, and complex ten-episode season that offers a look into the events that shaped the monarchy. There’s political intrigue, many an extramarital affair (seriously, it seems like everyone in any position of power in Britain was sleeping around- men and women), personal and professional triumphs and failures, beautiful sets and costumes, and, of course, some wonderful performances. Foy, Kirby, and many of the rest of the cast will no longer be with the series when it returns for season three, so enjoy their excellent work while you can. The Crown is a great historical drama and should be savored.